Leg Warmers? Check. Dancing on a yellow taxi? Check. Toe-tapping songs you'll find yourself humming through the night and well into the next day? Double check. 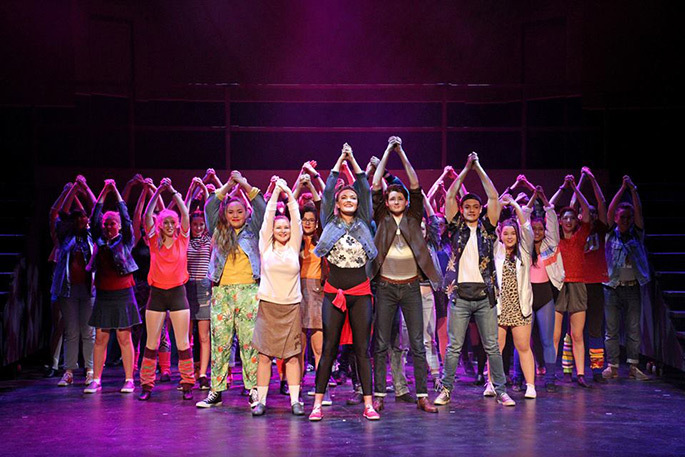 Tauranga Boys' College and Tauranga Girls' College came together and wowed crowds with a joint production of ‘Fame The Musical' at Baycourt on Wednesday to a very happy and very packed house. As a self-professed musical fan, this was a great performance to add to my ‘seen on stage' list. People were happily and loudly singing along to the well-known numbers, and it was great to see a live orchestra in the pit. Tyrone, played by Tauranga Boys' College student George Hiku, was a fantastic character and I would happily watch a sequel about where he ended up. Also a special mention must got to Nick Piazza played by Fletcher Oxford, and Serena Katz played by Caitlyn Farley. I'll be humming ‘Love Scene' for days. And my favourite bits? Opening the show with ‘Pray' was a good decision, and the softie in me couldn't help but love the ‘We Don't Need a Love Scene' song. So whether you've got a free dark night or a sunny Saturday afternoon, there are shows running until Saturday evening. With four more shows before closing the curtains, it's not too late to go and see this stage spectacular. Tickets are still available for ‘Fame The Musical'. Visit www.baycourt.co.nz for more information and to book.